Who knew there are so many varieties of recorder? The Flanders Quartet in action. 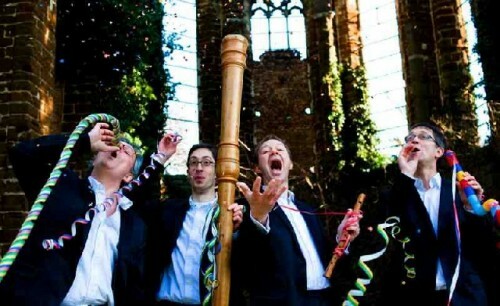 For more than twenty years, this impish group of superb musicians has traveled the world presenting Baroque music on the recorder. The sound they produce is celestial, but hardly angelic. Their exacting rhythms and phrasing create gritty and grounded tones. Recorders are a duct flute, most often with a whistle mouthpiece and distinguished by a thumbhole. The compasses of the recorders correspond to vocal ranges. They were seldom used in the classical and romantic periods, but returned with a renewed interest in the early-music revival of the 20th century. One of the performers pointed out early on in the program that Bach’s only fault was that he did not write for the recorder. The Quartet took this problem in hand and transcribed Bach. The transcriptions sit so well in the instrument that it is difficult to believe that they were not always meant to be played by recorders. This is just the Quartets’ point. Here Bach is interpreted with deep understanding and joy. The group travels with hundreds of recorders of various sizes and shapes and made from different materials. 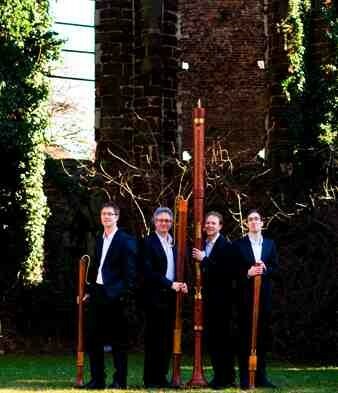 One recorder is taller than every performer in the group, a contra bass in F made by a Boston based craftsman, Frederich von Huene. It has a more mellow sound due in part to its length. Each performer often uses more than one instrument in playing a piece, but the transfer from one to another is seamless, and adds to the variety of sound and not incidentally to the pleasure of listening. So does the auditorium at the American Academy of Arts & Letters, which is not often used for concerts, but it is used for recordings. It is one of the few venues in New York that rivals Carnegie Hall for its sound quality. The spot on precision, clear intonation, arresting phrasing and dynamic range of the Quartet were on perfect display here. Today the recorder is a popular instrument used in music education and also in amateur performance. But this evening, it was clear that professionals who are skilled in recorder performance bring a special loveliness to the music they play. Many recorders were placed in ready position on the stage, but so also were about fifty bottles. Why we wondered, before looking at the program to note a performance of a contemporary piece, ‘On the Bottle’ by Geysen. We were forewarned that the piece clearly referenced another one from the Baroque era and sure enough, the first movement of Bach’s Brandenburg Concerto No. 2 peeked through from time to time, as witty a piece as the performers who undertook it. But not a piece to hear when you are on the bottle, because you will think you have succumbed, just as we did to the music. Encores of two housecomposers of the ensemble were South America by Jan van der Roost and Circus Renz by Jan van Landeghem. This evening, put on by the Miller Theater at Columbia, was sheer joy – the sound of the music, the charm of the group. Hear the Flanders Quarter wherever you can.